Thierry is a computer engineer and information scientist, expert in artificial intelligence and the quantum approach of information theory and the decision theory. He is a graduate of the Institut Mines-Telecom and holds a MBA of Paris-Dauphine University. Beside his works on the advanced artificial intelligence system Mileva, he has 25 years of experience in the banking information services with a leading European IT Consultancy. He conducts researches with Prof. Urs Luterbacher (Graduate Institute of International Studies and Development). Both co-authored « Predicting Crises and Monitoring their Evolution », in « International Journal of Peace Economics and Peace Science » (Cambridge Scholars Publishing). Honorary Professor at the Graduate Institute of International Studies and Development (Geneva), Urs is a senior fellow of the Centre for Finance and Development funded by the Pictet Foundation. He applies the game, decision, expected utility theories and the signal theory to the conflict issues and impacts of the global climate change. One of his upcoming publication is « Global Change Policy : Actors, Concepts and Enduring Challenges » co-authored with Detlef Sprinz, MIT Press. Since 2011, he contributes to Mileva’s evolution by implementing statistical methods of verification and various theoritecal approaches. For instance, he entered the types 1 and 2 errors into the system, which allow to refine the probability of the forecasts. He co-authored with Valerie Fert and Thierry Lorho « Predicting Crises and Monitoring their Evolution », in « International Journal of Peace Economics and Peace Science » (Cambridge Scholars Publishing). Historian, Valerie works on the future. Trained in the study of ancient Semitic languages, she translates the answers provided by the advanced artificial intelligence system Mileva. For a long-time journalist, she devises new approaches of information. She is the first point of contact for customers who need specific analyses. She is also the president of GMAP, a private research organisation dedicated to the analysis and foresight of the 21st century major transformations. She co-authored with Thierry Lorho and Prof. Urs Luterbacher « Predicting Crises and Monitoring their Evolution », in « International Journal of Peace Economics and Peace Science » (Cambridge Scholars Publishing). Valerie is a graduate of Ecole Normale Superieure and Ecole Pratique des Hautes Etudes. 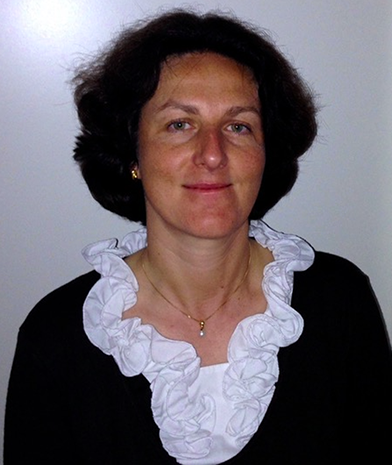 Elisabeth is a holistic information governance expert. She contributed and managed global information governance programmes for 20 years in multiple industries such as consumer goods, sports, biotech, humanitarian demining, particle physics. Passionate for sustainable solutions, her career motto is to bridge technology, people and processes for a better humankind. As a new part-time team member of Mileva since summer 2018, she will guide you through Mileva products range and benefits, and accompany you through your journey with Mileva: help to configure it for a maximised return on invest, monitor your subscription to keep it aligned with your needs and process and route all your specific requirements.